This article is the first installment of a five-part series on foods you must have in summer. Over the next four weeks, we’ll be rolling out a new story on a specific region of the U.S. each week, so be sure to check back for the latest every Friday. We couldn’t include a mention of every local food and eatery, but we would love to hear about your personal favorites in the comments below. With fresh bounty from the sea and local farms, food and summer go hand in hand in New England. 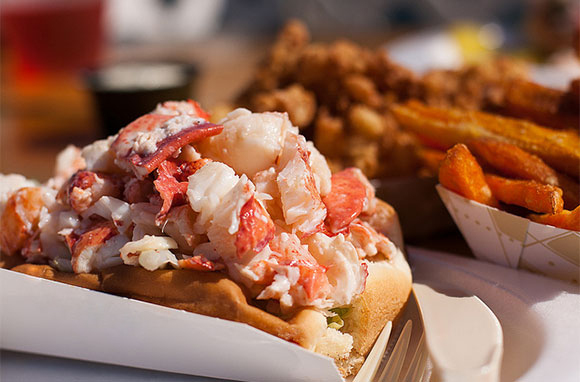 From lobster rolls and clambakes to fried dough and wild blueberry pie, we’ve rounded up the best of the season, Yankee-style. Whatever your dish of choice, rest assured that it will likely be followed by a heaping scoop of homemade ice cream. Blueberries grow all over the country, but there's nothing quite like the tiny, wild bleuets found in Maine. Bake them inside a two-crust pie and you get the sweet essence of summer concentrated in dessert form. Originally made by early American settlers, blueberry pie remains simple with a nostalgic, just-like-grandma-used-to-make quality. In fact, it is so loved that it won the battle for the state's official dessert. Sure, you can eat it year-round, but it's truly best in August when the berries are just plucked and absolutely fresh, not frozen or canned. So when you head Down East this summer, be sure to stop for a slice along the way. Where to Go: The pie is available at many roadside restaurants and diners up and down Maine's coast, but Helen's Restaurant in Machias is famous for its rendition. The Broad Arrow Tavern at the Harraseeket Inn in Freeport serves it a la mode with homemade vanilla ice cream. And the version at Waterman's Beach Lobster in South Thomaston (near Rockland) is showing up on "best of New England" lists. 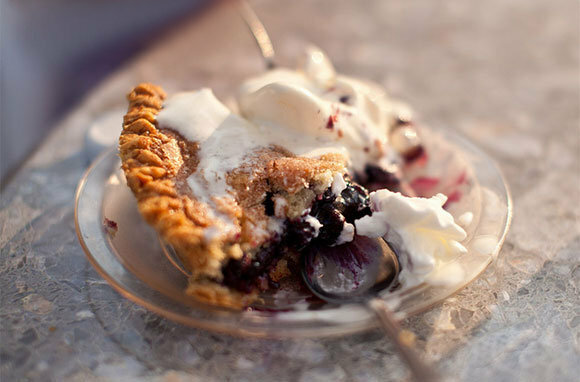 For blueberry-pie extremists, the annual Machias Wild Blueberry Festival in August is host to a pie-eating contest. While other regions have the hot dog, New England has the lobster (locally pronounced "lobsta") roll. Available in all the coastal states, the sandwich usually consists of a split-top bun, often warmed and buttered, stuffed with large chunks of rich tail and claw meat. While no one really knows the exact origin of the roll, there are definitely two solid camps in terms of its preparation: Connecticut-style (with drawn butter) and Maine-style (with mayonnaise). Most variations incorporate ingredients like celery salt, paprika, and lemon juice, but you can continually find new interpretations, especially in cities like Boston. 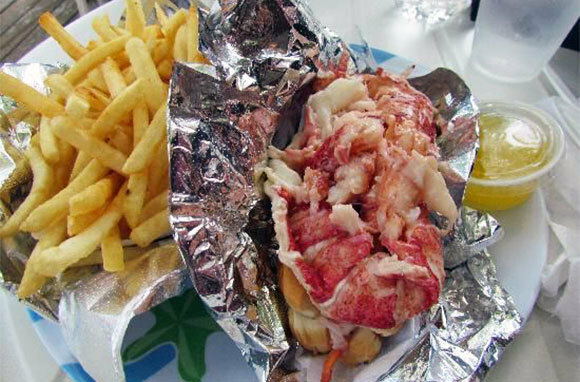 Where to Go: In Maine, lobster-roll aficionados swear by Red's Eats in Wiscasset or Kennebunkport's The Clam Shack, which won America's Best Lobster Roll at Tasting Table's 2013 Lobster Roll Rumble. The Beach Plum, with locations in North Hampton and Portsmouth, New Hampshire, gets plenty of accolades, and those in Cape Cod love Sesuit Harbor Cafe, which also hosts a lobster-roll cruise. Battered in milk and corn flour, then deep-fried: That's how clams are done in New England. Harvested in tidal mudflats and served up in seaside shacks, these bivalves—often soft-shell clams, also called "steamers"—come crispy, in strips or whole bellies, and are synonymous with summer. 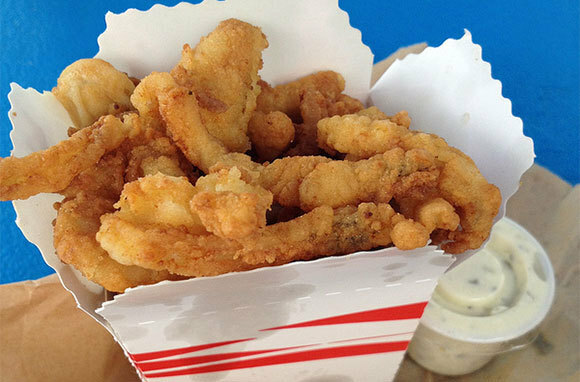 Likely invented in Ipswich, Massachusetts, by Lawrence ("Chubby") Woodman in 1916, fried clams are now a staple along the coast. The shacks serving them tend to be open seasonally and have long lines, but the anticipation is part of the experience. Where to Go: New Englanders take fried clams very seriously; this is evident in the Boston Globe's recent Shack Showdown that pitted some of the area's best eateries against each other, head-to-head. While top honors in the contest went to the Clam Box of Ipswich in Massachusetts, each state has its own favorites. Woodman's of Essex offers the Clam Box serious competition in Massachusetts and claims to have invented the fried clam, and SmarterTravel staff likes The Bite in Menemsha on Martha's Vineyard as well as Bob's Clam Hut in Kittery, Maine. Find a great list of clam shacks on Boston.com. 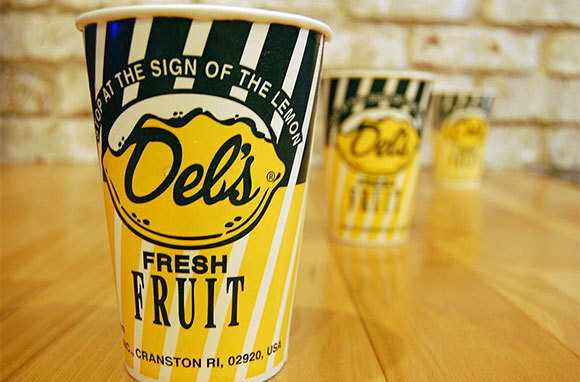 Created in Italy but made famous at a small stand in Cranston, Rhode Island, Del's Frozen Lemonade—originally made with the right proportion of snow, sugar, and lemon juice—is a refreshing summer go-to. Today, its unique flavor comes from the use of the whole lemon, including the oil, pulp, and rind. You don't need a straw to drink it; just let the heat of your hand soften it enough to sip right out of the cup. The company that began selling frozen lemonade in 1948 has now expanded to multiple locations and has a flavor list that includes grapefruit, pomegranate, and watermelon. Where to Go: While the slushy treat is sold in more than 45 franchises in states as far away as California, you can still visit locations throughout New England, most of which are in Rhode Island. Yes, we know about the old adage, "Only eat oysters in months with the letter r," but New Englanders don't seem to care, and they associate the fresh mollusks with summertime. And thanks to modern farming practices and refrigeration, we're happy to roll with it, too. Harvested from cool, brackish waters, the delicacies—classified as virginica oysters—have a distinct saltiness and are usually served raw with traditional cocktail sauce or mignonette. Just pour the oyster and brine (with any condiments) into your mouth, right from the shell. 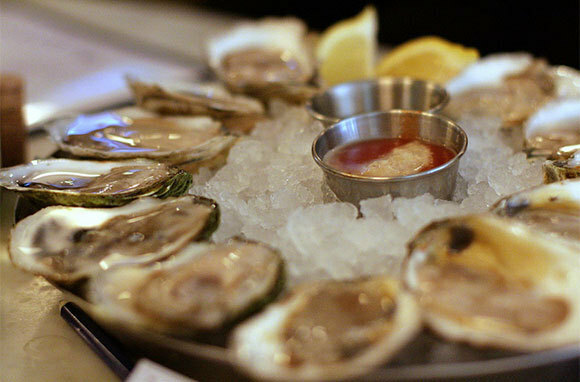 Raw bars stock the area's best, from Massachusetts' Duxbury and Wellfleet oysters to the Quonset Point variety from Narragansett Bay, Rhode Island, and the popular Blue Points from Connecticut. Where to Go: When it comes to raw bars, Boston offers a bevy of choices, including Island Creek Oyster Bar, Neptune Oyster, and B&G Oysters. Matunuck Oyster Bar in South Kingstown, Rhode Island, is located right next to the farm and is a local favorite. Found at country fairs, boardwalks, and road- and seaside stands, fried dough signals New England summer in all its greasy, guilty-pleasure glory. Similar to pizza crust or bread dough, this old-time treat is raised with yeast and always deep-fried. Puffy air pockets form on the inside, while the outside crust turns golden brown and crispy, making it especially satisfying to bite into. While fried dough is traditionally dusted with powdered sugar (or sometimes drizzled with honey or maple syrup), different variations, both sweet and savory, are popular. Where to Go: In New Hampshire, you can get fried dough at Hampton Beach vendors such as Blink's Fry Doe, which has 20 different flavors, from Cinnamon & Sugar to Garlic & Buttery. 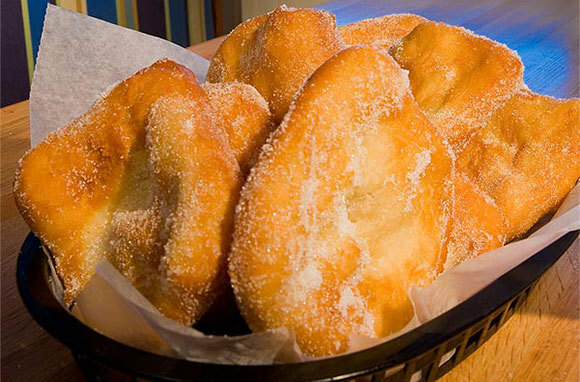 Iggy's Doughboys & Chowder House, with locations in Warwick and Narragansett, Rhode Island, is famous for its "doughboys," described as "a cross between a doughnut and fried dough" and served warm and completely coated in sugar. 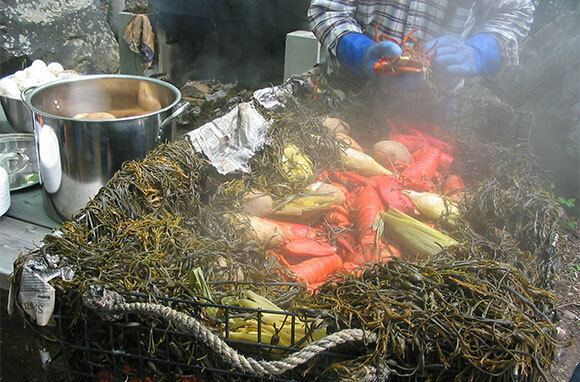 A centuries' old tradition, the New England clambake is a highlight at special events and summertime gatherings. On the beach in a stone-lined fire pit, heaps of seafood such as lobster, mussels, steamers, and quahogs (a type of hard-shell clam) are layered with wet seaweed and steamed under a canvas tarp for several hours. When done in a pot, it's known as a clam boil. Accompaniments include corn on the cob, potatoes, and sausages, and the meal is often followed by cobbler or pie. Where to Go: Clambakes and lobster bakes are available through New England caterers and restaurants, such as Ipswich Clambake in Ipswich, Massachusetts, which won a TripAdvisor Certificate of Excellence in 2013. The upscale Chatham Bars Inn prepares clambakes several times per week. And Cabbage Island Clambakes in Boothbay Harbor, Maine, does it the old-fashioned way at the water's edge. SmarterTravel staff recommends Chauncey Creek Lobster Pier in Kittery, Maine. New Englanders of every state love ice cream, whether oversized in a cone or slowly melting atop a warm cobbler or slice of pie. And each state boasts a local favorite or two. Connecticut: Mystic Drawbridge Ice Cream has been producing homemade ice cream for more than 100 years. The Courant has a list of other Nutmeg State favorites. Maine: Gifford's Ice Cream and its Maine-inspired flavors like Moose Tracks can be found in shops and stands throughout the state. 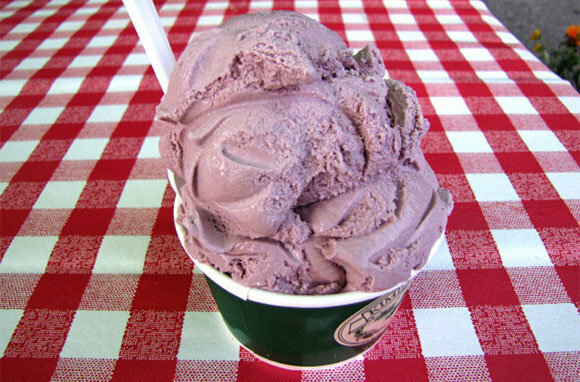 Mount Desert Island Ice Cream in Bar Harbor is known for unique flavors like Blueberry Basil. Massachusetts: A working dairy and ice cream stand, Richardson's Ice Cream in Middleton is a local go-to spot. Other faves include Kimball Farm in Westford, Christina's Homemade Ice Cream in Cambridge, and Mad Martha's Homemade Ice Cream, with several locations on Martha's Vineyard. New Hampshire: Big scoops are the norm at The Ice House Restaurant and Lago's Homemade Ice Cream, both in Rye. Hayward's Ice Cream in Nashua has been making premium ice cream since 1940. For more, follow New Hampshire's ice cream trail. Rhode Island: Gray's Ice Cream in Tiverton is an area legend and offers traditional and New England-inspired flavors such as Grapenut. Vermont: In Vermont, favorites include Groton's Artesano Ice Cream, which incorporates local fruits, Montpelier's Morse Farm Maple Sugarworks, offering soft-serve maple creemees, and of course the Ben & Jerry's factory in Waterbury. Be sure to check back with us next Friday for the second installment, Foods You Must Have in Summer: Mid-Atlantic.